Cap and trade is a financial market for the right to pollute, and where there are financial markets, there are too-big-to-fail banks. But a bank isn’t interested in reducing carbon any more than it is in growing corn or pumping oil. It’s interested in perpetuating a market for its own sake, so it can extract fees and create trading opportunities. The Environmental Defense Fund and others argue that only cap and trade, and not a carbon tax, guarantees carbon reductions. That’s because cap and trade sets specific limits on how much pollution a facility can create. Won’t rising demand driven by the declining caps make the allowances so expensive that polluters will have to reduce their carbon or go out of business? When the emissions cap ratchets down, there’s likely to be a lot of politics to rearrange the system. 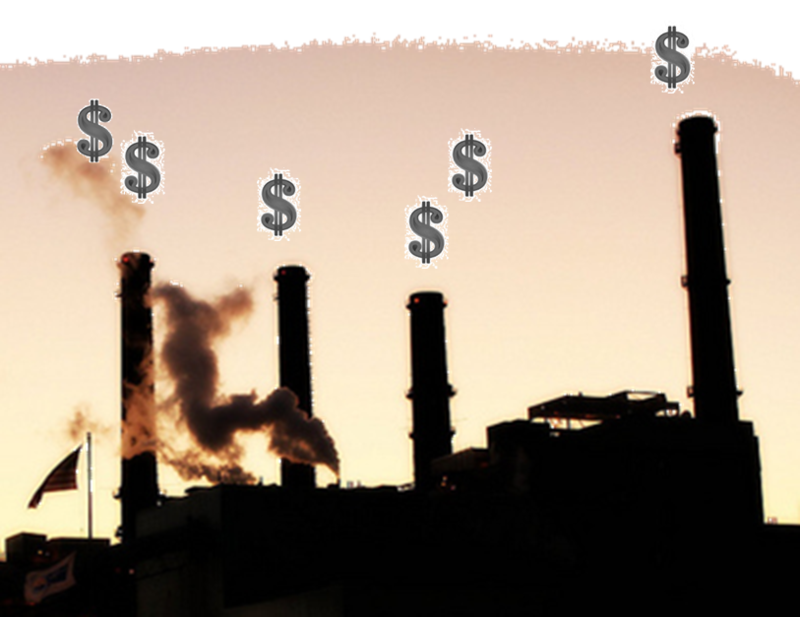 At the very least, the banks and big polluters will lobby to create more allowances. But there’s one constituency the banks and fossil companies won’t have to worry about in that negotiation: the public. We won’t have a clear economic interest, so our concerns will be overwhelmed by those who do. Didn’t cap and trade successfully reduce acid rain in the 80’s and 90’s? Yes, it did. But that market affected only a few utilities and was limited to specific pollutants, chiefly sulfur dioxide (SO2) and nitrogen oxide (NOx). The constituencies who wanted the reductions were powerful states like New York and Massachusetts, whose environment was directly affected. And the problem could be addressed by adding scrubbers onto smokestacks. The power plants could still burn coal. With carbon, the situation is the opposite. The market is our entire economy. The constituencies who don’t want reductions are the stronger ones—the multinational fossil fuel companies. And the problem can’t be addressed with a bolt-on solution. For carbon reductions to work, the coal, gas, and oil have to go away. Now, with whom are the banks going to align themselves in this situation? They want the hosts they’re sucking their fees from to stay alive. They’ll be motivated to lobby the government to weaken the cap reductions or create more allowances to keep the price down. This happened in Europe. To get businesses to accept the scheme at all, the European Union flooded the market with allowances. Result: the price of a tonne of carbon pollution went to almost zero. Currently, it’s about $8.00 per tonne. California took that lesson—again, sort of. The allowance price started in the $20 range in 2011. But the Air Resources Board gave out a lot of freebies to get the program off the ground. The price has since declined, and has remained $12.00-$13.00 per tonne for the past two years, adding about a dime to the cost of a gallon of gasoline. That’s swamped by the two-dollar swings we’ve seen in those years. My guess is that most people don’t even know there’s a cap-and-trade cost embedded in their gasoline price. An annually escalating carbon-fee-and-dividend doesn’t require banks to work. The dividend-receiving public would be all over any attempt to modify the annual fee escalation which, besides motivating producers to squeeze carbon out of their cost structure, is the only moving part available for the affected businesses to negotiate. And where cap and trade is exclusive and opaque, a carbon fee and dividend is inclusive and transparent. But can a carbon fee be effective in reducing emissions? Taxes have been effective in reducing tobacco consumption. According to the Center for Disease Control, the per-capita consumption of cigarettes declined by more than 40% from 2000 to 2011, as tobacco taxes increased. Youth smoking went down by 50% from the early 80’s to 2007. Sure, other factors like public education also had an effect, but the correlation with higher cost is compelling. Besides, climate change is literally a hot topic, so the public education angle is covered. It’s hard to say how much of the GHG reductions we’ve seen in California are the result of cap and trade. In my mind, it’s mostly attributable to direct regulation around efficiency and renewable power standards for electric generators. To reduce carbon emissions rapidly and at scale, we should prefer a democratic carbon fee-and-dividend. If cap and trade gets in place on a national level, it’ll immediately create entrenched corporate interests. Let’s keep that interest for us, the people, who stand to lose the most if we don’t solve the carbon conundrum.